Kayaking the "Cedar Keys" and Suwannee Sound offers the naturalist a cornucopia of beautiful reefs, sandbars, and keys to explore. The shallow waters of the Lower Suwannee National Wildlife Refuge are beautiful with abundant bird life, dolphins, and of course enough fish to make Cedar Key a sea kayaker's dream! Canoes, pirogues, and kayaks are familiar sights as you wander the island. We recommend that your bring your own kayak or canoe for an optimal experience! The nice sandy beach at our vacation rental condo Tranquility is a perfect spot for you to launch and we have kayak/canoe racks for storing your canoe or kayak while you stay with us. For professionally guided kayak tours - checkout Brack Barker at Wild Florida for Nature Coast Tours including Shell Mound, Cedar Key-Atsena Otie Key, and Sunset Tours. Or contact Adventure Outpost for kayak rentals and Cedar Key Kayak tours. Great photos and good information! A great trip report - a bike trip and then paddling trips in Cedar Key: Shell Mound, Pine Island and Deer Island. Three paddles in 2003 Thanksgiving to Atsena Otie and the Cedar Keys. Yackman.com has a great article on paddling the Cedar Key area with several trips described: to Town of Suwannee to Cat Island, Shell Mound to Deer Island, and Purvis Landing to Manatee Springs. Adirondack Exposure offers lodge based Cedar Key Kayak trips several times a year. You can check out their trips on their website. They also maintain a Facebook page with more information. 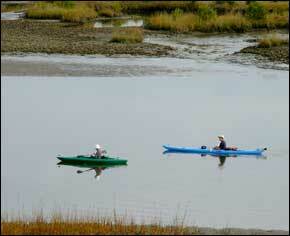 Check out Wild-Florida for paddling opportunities in Cedar Key and the surrounding area. They are open year round by appointment and have special tours available. Contact Brack Barker at brack154@msn.com or call 877-945-3928/352-528-3984 and leave a message and phone number. Al Vazquez of KayakGuide.com has published two great paddling pages: Atsena Otie Kayak Route and Trip Report and Cedar Key to Snake Key, Florida USA. Peggy's kayaking trips are great stories unto themselves, combine that with her fabulous photos and well, you be the judge if this doesn't just make you want to come visit us and paddle Cedar Key! More links about kayaking in Cedar Key including maps, links to fishing resources, and trip reports. VisitFlorida has some information about kayaking in Cedar Key and along Florida's Big Bend. These folks have a good reputation and offer a variety of kayaking tours in Cedar Key and Florida's Big Bend. Wild Florida offers tours of the Lower Suwannee and Cedar Keys National Wildlife Refuges (NWRs) including the Shell Mound Tour, Atsena Otie, and a Sunset/Moonrise Tour. Cedar Key and Local Area "Yakking Events"
Looking for area kayaking events? Don't look further - here's a great calendar of paddling events! Experience a moonlit paddle on the Suwannee River at Manatee Springs in your kayak or rent one at the park for $15 (call and reserve in advance!) Paddle the Suwannee River at Manatee Springs. See the Cedar Key boating page and Cedar Key Fishing Page for more links!